Finding perfect 21st birthday wishes is easy — right here. Choose from over 40 original birthday messages for 21 year olds (on this page and the two previous pages) that say what you want to say. And don't just opt for 21st birthday messages that just rely on the same, tired jokes about legal-age drinking, wild parties, hangovers and the like. Pick birthday wishes that go a little further. 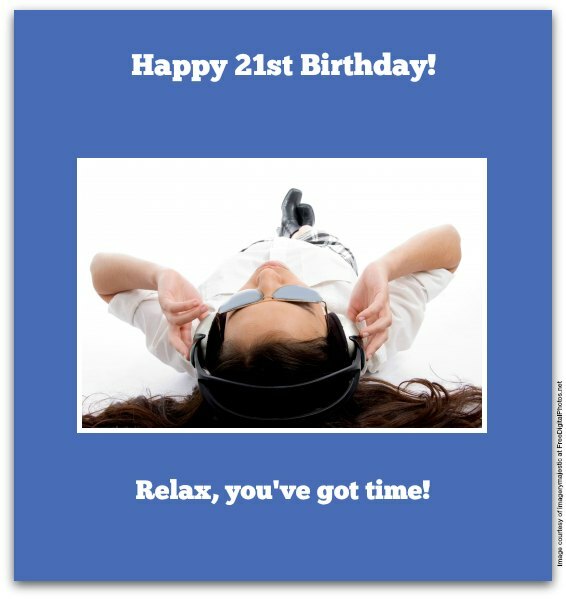 Select 21st birthday greetings with just a touch of legal-age drinking humor, plus a tab of inspiration and wisdom thrown in. The exact amount of each ingredient depends on the 21st birthday boy or girl. Fortunately, we have many blends below. 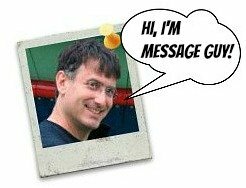 If you require a few helpful hints before you search for the perfect birthday verse, you may want to take a detour and read all one minute of the 21st birthday message tips that come with Message Guy Tip #68. Interested? Go here. Every day for the past 21 years has been special to us because we've shared them with you. Enjoy every moment of your special day as much as we've enjoyed our time with you. Happy 21st birthday! Happy 21st birthday! This is a wonderful time for you to experience life to the fullest, make mistakes and learn some important lessons. Don’t waste a second. Happy 21st birthday! Be strong, be kind, be young, be wild, be free, be responsible and, above all, be yourself. Happy birthday! Remember, we are always here for you — today, on your 21st birthday, and every day for the rest of your life. Happy 21st birthday! Now you can legally do the things you’ve secretly done since you were a teenager. Not as interesting, eh? Welcome to adulthood. Don't sweat your ascent into adulthood! You're not over the hill yet. Happy 21st birthday! Turning 21 is a major milestone. It's so much more than the legal privilege of buying a martini. It's the first day of your journey into the world of adults. May yours be filled with joy and adventure. Happy 21st birthday! Happy 21st birthday! Now you're old enough to prove to the world that you're the loving, dependable, caring, mature grown-up I've always thought you could be! Even though you're 21 now, I'm certain that you'll still be carded at bars and casinos. You look too young to be in the 21 club! I wish you all the best in the world, including eternally young looks! Happy birthday! May every experience you have in life be as great as today, the day you turned 21. Happy 21st birthday! You're a grown up now, but that doesn’t mean you have to stop having fun. Today is actually the beginning of your next big adventure. Happy 21st birthday! Say goodbye to your childhood. This is the first day of the rest of your adult life. It's going to be a blast! Step 1: Enjoy your 21st special day while it lasts. Step 2: Repeat Step 1 for every other day in your life. Happy 21st birthday! Happy 21st birthday! Your future looks bright — become the shining example I know you can be. You definitely have more than 21 reasons to be thankful for celebrating another year in your life. But I’m thankful for just 1 reason — you! Happy 21st birthday to my favorite person! You are now 21, the age many people start expecting more from you. Don’t sweat it — you have the rest of your 20s to mess up, bounce back and show everyone what you've got. Happy 21st birthday! Happy 21st birthday! Lie back, relax and don't fret about the future — you've got all time in the world! Happy birthday! At 21, you’re just at the threshold of adulthood and all the wonderful things that come with it. Start counting your blessings!